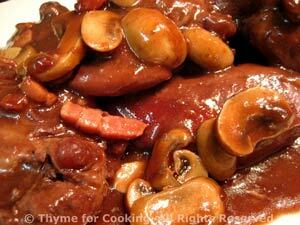 Coq au Vin, the classic French Bistro dish, easy and elegant main course. Chicken in red wine. Traditionally this would use a rooster (rather than a hen) and cook for several hours (as the coq would tend to be a tough old bird - but full of flavor). You can use a whole, cut-up chicken, (broiler-fryer) or, do what I did, use skinless breasts and thighs. Without the skin the flavors get deeper into the meat and we eliminate a lot of the fat. Use a full-bodied Burgundy or Cote de Rhone (or equivalent) for this. Not expensive, but drinkable. Do not use 'cooking wine'. The secret to this dish is the cocoa - it gives an amazing richness and depth of flavor. To marinate: Roughly chop the onion and carrot. To cook the chicken: Remove chicken from marinade and drain well (over marinade). To cook the vegetables: Clean mushrooms and shallots, leaving shallots and small mushrooms whole; slice large mushrooms in half. To finish: Remove chicken from pan and cover to keep warm.